In recognition of National Poetry Month, Morning Edition's Renee Montagne talked with Karen Jo Shapiro on Tuesday about her poetry books. In the story Author Makes Famous Poems Fun For Kids, Shapiro reads some of her work and talks about her poetic parodies. I enjoyed the story and the exercise of guessing which famous poem each parody was based on. After listening I read through the comments, which were highly polarized. Here are a few examples (both in favor and against). I am not just disappointed, but saddened that NPR would encourage the dumbing-down of poetry for children. I think it is wonderful to introduce children to poetry in ANY form. Perhaps we should lighten up a bit. So, I offer poets like Charles Ghinga, Shel Silverstein, Dr. Seuss and Maurice Sendak who write wonderful children's poems that I love!!! No need to dumb down other poems. These poems were written for small children, to get them interested in a lifetime love of poetry reading. Once a child's ketchup and macaroni filled mind are entertained by the thought of reading these 'oversimplified' versions, they might actually be moved to read the classic poems that Ms. Shapiro is introducing to them. After hearing Mary Jo Shapiro's poems that were "inspired" by classic poems, I plan on teaching the original poem along side Shapiro's version. I'll do anything to help a student make a connection, so that when they do encounter a classic poem (or its poet) later on in school, they will have some background information with which to make a connection. I am a believer in lifting children UP to the level of the literature. We NEVER dumbed down great authors to our kids. Getting kids away from the ever-present screen and into the page is the first step in getting them to be readers, and Karen Jo's book of poem "makeovers" might be a doorway into the unplugged world. I found this whole conversation about "dumbing-down" poems both fascinating and irritating. Since when is parody dumbing-down? Frankly, to parody well you need extensive knowledge of the original work. I think kids, particularly those in middle school could really exercise some poetic muscle by writing parodies of their own. I haven't seen the books (yet), but they seem like they might make wonderful mentor texts. I always meant the books to work on two levels at the same time, and so, the poems stand alone. I go in and read them to kindergartners, first graders, second graders who have never heard of William Shakespeare and they just appreciate the funny story, eating ketchup or eating macaroni and cheese and they appreciate it at that level. But what I wanted to give them that was extra is that it has these beautiful meters and rhythms taken from such wonderful writers like Edgar Allan Poe . . . The older kids, the middle schoolers that are just starting to learn about some of these famous poets, it kind of gives them an entryway or a way to connect with poets whose language is often difficult, and so this gives them a way to see that they can connect to poems in a more familiar way. You can learn more about these titles by clicking on the images above. 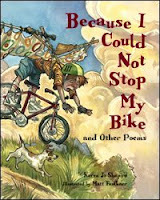 Teachers will find that they can download the full text of the original poems (in PDF format) that inspired the parodies for both I Must Go Down to the Beach Again and Because I Could Not Stop My Bike. To hear a few more of these poems, listen to this podcast from LAPL (Los Angeles Public Library). For more information about the author, visit her web site. So, what say you dear readers? How do you feel about such parodies? Inquiring minds want to know. Stella, Unleashed: Notes From the Doghouse goes to . . .
Bridget at What is Bridget Reading? The challenge this week was to write a tritina, a 10-line poem composed of three, 3-line stanzas and a 1-line envoi. Like the sestina, a tritina uses an end-word scheme instead of a rhyme scheme. Here are the results. Skipped by a child into the sky. Such an enormous gem stone? And strolled into sky town, the boys whistling at the moonstone and me. Harriet at spynotes shares two poems in her post Dot's poetry corner. Julie Larios at The Drift Record left this poem in the comments. When P-Head asks, "What's up, Little Lady?" Ms. L-heart says, "Who's asking? Jacqueline at Neverending story shares a poem entitled A Tentative Tritina. Dianne White shares the poem One Bird, One Branch, One Song. Andi at a wrung sponge gives us the poem When maple flowers cover the picnic table. I'm sharing two poems this week. The first was what I wanted to write about, the second is where the poem took me. I suppose this is why I write poetry--to put what's in my heart on the page, particularly when words don't come or can't be spoken. There is no mourning, only eyes watching owl, free to dance another day. when you are in his grasp? Light. Dark. Life. Death. We are all in their grasp. Today is the last day of National Poetry Month, but there's no reason to be sad because today is a day for celebration! It is El día de los niños/El día de los libros, Children’s Day/Book Day. Here's what Pat had to say recently about this special day. and to parents and families as partners with libraries and schools in the literacy process of sharing bookjoy. Día culminates in annual celebrations of these daily commitments across the country on or near April 30th, community book fiestas. 2009 is its 13th anniversary. Here is a poem Pat wrote in 1998 to celebrate Día. the children and their books. los niños and their books. on this day of children and books. Pat does such a wonderful job talking about her work that I want to share this video before we learn a bit more about her. Pat: Early in my life, I experienced what I now call bookjoy. I fell in love with words and reading when I was a little girl in my home city of El Paso, Texas. Poetry was delightful to read; and in school, I had excellent teachers who made us memorize many poems. I probably griped then, but I say “thank you” now. My parents gave me a box of pretty stationery and a gray, portable typewriter when I graduated from eighth grade. I remember sitting and typing rhyming poems with these gifts. I returned to writing poetry years later when I was expecting my first child, and again years later, I made a commitment to myself to write regularly. Who/what made you want to write? Pat: I’m a writer because I’m a reader. Words and languages lured and lure me to the page. I’m attracted to both the pleasure and power of writing. What got you hooked on children’s poetry? Pat: Questions and ideas from teachers and librarians have been catalysts for a few of my books. Standing in a line to have a book autographed at a conference in the Cincinnati/Northern Kentucky area, I was asked by a teacher or librarian, “If you write poetry for adults, why don’t you write poems for children?” Great idea, I thought, and began poems that became Confetti: Poems for Children, also now available in Spanish. It makes me happy that April 30th, celebrated across the country as El día de los niños/El día de los libros, Children’s Day/Book Day, is the last day of National Poetry Month. We can foster lots of young poets. Have you had any formal poetry training? If not, how did you learn to write what you do? Pat: I majored in English for both my undergraduate and graduate degrees. That was before creative writing programs existed. I briefly audited one adult creative writing poetry course about thirty years ago. I read poetry, attend readings when possible, and occasionally teach writing poetry workshops. Mostly, I practice. Can describe your poetry writing process? Pat: Yes and no. I’m currently revising a book of letters to teachers and librarians about creativity practices for ourselves and for our diverse students. The book will be published in 2010 by Corwin Press, so I’m mighty busy at present. At this point in my life, I often write poems whether for children, teens or adults, as part of a book project. For example, I recently completed a collection of poems I wrote in the voices of teens that will be published in 2010 by Knopf. In brief, I select a topic or voice or line or situation that intrigues me, and then I begin to play a bit on the page. I let the poem lead me along. Moment of confession: Revision may be my favorite part of the process. What are the things you enjoy most about writing poetry for children/young adults? Pat: It’s a privilege and a blessing to sit in a safe place in our unsafe and often unjust world and to have the opportunity to listen to words in both English and Spanish. I enjoy the challenge of connecting with the heart of someone I may never meet or of bringing verbal delight to a child or adult. Do you have a favorite among all the poems/poetry books you have written? Pat: I resist questions about favorites whether about my three children or my books. I tell students—whether little ones or grad students—that my favorite book is the next book. At present, I’m curious to discover how teens will respond to the book I wrote for them. My hope is that any teen will find at least one poem that connects with her or him. Would you like to share the details of any new poetry project(s) that you’re working on? Pat: I didn’t tell you that the tentative title for the new book for teens is Dizzy in Your Eyes: Love Poems. Incidentally, the idea was given to me by a Texas librarian. My previously published collection for teens, My Own True Name: New and Selected Poems for Young Adults as suggested by a California librarian. Pat: Pablo Neruda is one of my favorites. Your favorite place to write? Pat: I usually write at my dining room table. That may not sound evocative, but I like having my books around—thesaurus, English and Spanish dictionaries, books of poetry forms, etc. Your nominee for the next Children’s Poet Laureate? Pat: I have problems enough without thinking about the complex world of awards. Wishing you all bookjoy! Pat's book Yum! ¡Mmmm! ¡Qué Rico! : America's Sproutings, was awarded the Américas Book Award for Children's and Young Adult Literature in 2008. Accompanied by the gorgeous artwork of Rafael López, Pat's text combines factual information about edible plants native to the Americas with crisp, sense-filled poems all in the form of haiku. Kids reading this book will be hungry to try out some of the foods so deliciously described. Here are a few yummy examples. Brown magic melts on your tongue. Smell grits, tortillas, corn bread. Each of the descriptions of the plant/food describes where the plant originated. 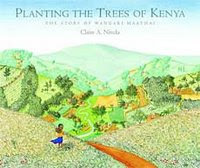 Last fall I used this book to teach a lesson on geography and natural resources (things we get from plants). I first found my way to Pat's work while looking for bilingual poetry to share with students. Even though the book I found wasn't entirely bilingual, it included a lot of Spanish words and had an extensive glossary in the back. That book was Confetti: Poems for Children. Here are two of my favorite poems from this work. in the clouds so high? What do you see in the sky? as they go slithering by. What do you see? Tell me, do. high in the shimmering blue. Red shouts a loud, balloon-round sound. Black crackles like noisy grackles. Café clickety-clicks its wooden sticks. Yellow sparks and sizzles, tzz-tzz. White sings, Ay, her high, light note. Verde rustles leaf-secrets, swhish, swhish. Gris whis-whis-whispers its kitten whiskers. Azul coo-coo-coos like pajaritos do. Oro blares, a brassy, brass tuba. Orange growls its striped, rolled roar. Many people (including me!) 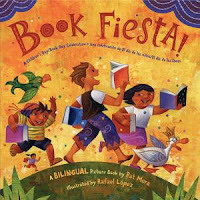 will be celebrating Día this year by reading Pat's new book, Book Fiesta! : Celebrate Children's Day/Book Day; Celebremos El dia de los ninos/El dia de los libros. Illustrated by Rafael López, this book celebrates children and reading. It even includes a letter from Pat with suggestions for celebrating Día. You can hear echos of Pat's "Song for April 30th" in the text of this vibrant book. It begins this way. Hooray! Today is our day. ¡El día de los niños! ¡Viva! Hoy es nuestro día. in Chinese and Navajo too. en chino y en navajo también. Here's wishing you a fabulous Día and, to use Pat's word, much bookjoy today and the whole year through. To learn more about Pat and her work, consider visiting these sites. Video interview with ¡Colorín Colorado! Original poem written for the April shindig at Gotta Book. Please give a rousing cheer to Pat for launching Día 13 years ago and for participating in the Poetry Makers series. All poems ©Pat Mora. All rights reserved. I have one title left to give away in celebration of National Poetry Month. Steady Hands: Poems About Work, written by Tracie Vaughn Zimmer and illustrated by Megan Halsey and Sean Addy, is a collection of 34 free-verse poems on a variety of jobs and careers. The book opens with a poem called "Morning" and ends with one called "Night." In between are insightful poems packed full of information, though not in an overt manner. The metaphors and descriptions offered are lovely and thoughtfully chosen. Here are two of my favorites. in the backroom of the bakery. Leave me a note about a job that you think would make for an interesting poem and I'll enter you in the drawing to win. You have until midnight on Thursday (April 30) to enter. All poems ©Tracie Vaughn Zimmer. All rights reserved. 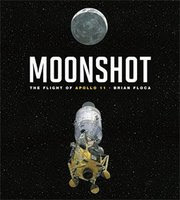 Last night I posted a review of the fabulous new book by Brian Floca, Moonshot: The Flight of Apollo 11. If you live in or around the D.C. area, you may want to pay a visit to the Smithsonian National Air and Space Museum this Saturday (May 2nd). Brian will be signing copies of his book in the Gallery 101 - Museum Shop from 12:00-2:00 pm. Here are directions if you need them. In the meantime, check out the book trailer. As April nears its end, I am delighted that Mary Ann Hoberman, the current Children's Poet Laureate and 2003 winner of the NCTE Award for Excellence in Poetry for Children is joining us. Let's start with an interview from the March 30th edition of Barnes & Noble Tagged. You'll find a brief conversation with Mary Ann through about minute 3:40, and then an original poem called "A Confession" beginning around minute 6:45. Before we look at some of Mary Ann's work, let's learn a bit more about her. Mary Ann: As I say on my website, I was writing poems, and songs and stories, even before I learned to write, making them up in my head and telling and singing them to myself, to my imaginary playmate/brother, Billy, and to my real little brother, Joel. I can't remember a time when I wasn't in love with words. Mary Ann: Looking back, I think it was loving fairy tales so much that gave me the idea that I could be a writer, too. Even though fairy and folk tales are usually anonymous, in the two books of them that I possessed as a small child (and still have, by the way! ), some of them were credited to specific authors. My third story book, also still on my bookshelf, was by Hans Christian Andersen, very much an author of his own tales! I loved all of these stories so much that I decided that I, too, wanted to be a writer when I grew up. Mary Ann: Getting hooked on poetry itself must be genetic. I have always loved rhyme and rhythm and music and song. Getting hooked on writing poetry for children arrived at the same time as my own children did. From the time they were tiny, I began to make up little verses and songs for them. For a long time I never wrote these bits and pieces down, just carried them around in my head and brought them out on walks and car trips and at bedtime. And then I got the idea for my first book, "All My Shoes Come in Two's," and asked my husband, Norm to draw some illustrations. I mailed the manuscript off to a publisher, it was accepted, and that's how I began writing for children. Mary Ann: I was writing poetry long before I knew anything about the terminology and forms of poetry. When I eventually discovered iambs and dactyls and stresses and poetic forms, I discovered that I had been using these devices unknowingly all along. Even now, it is only after the fact that I discover what categories the verses I have written might fall into. Of course I deliberately turn my hand and mind to a sonnet or a limerick every once in a while, but mostly I follow where the cadence leads me and only afterward do I sometimes bother to put a label to what I have written. Mary Ann: A rhythm pops into my head, sometimes clothed in words, sometimes not, and I take it from there. It is a delightful way to occupy one's time, turning over sounds and meanings and rhythms, tasting them in your mind's mouth, hearing them in your mind's ear. Unless I am writing on some sort of assignment, I generally wait for the poem to find me, rather than go in search of the poem. And even for an assignment, I must depend on something rising up from the depths of my mind, some cadence or combination of words, before I can proceed. Mary Ann: There is very little I don't enjoy about this occupation! I have said many times that I consider myself very lucky to have been able to make a vocation out of something I so love to do. Word play, playing with language, getting it right, and sending it out into the world in a beautiful book, illustrated by some of the most talented artists in the field. What could be better than that? Mary Ann: My favorite poems are "Brother" and "Mayfly." My favorite book (although choosing one is like asking a mother who her favorite child is!) is probably HELLO AND GOOD-BY, my third book, illustrated with black and white line drawings by my husband, published in 1959 and long out of print. It contains many of my favorite poems, the ones written when my kids were tiny, and it is a tiny book itself, small enough to fit into a child's hands. Mary Ann: This summer ALL KINDS OF FAMILIES! will come out, illustrated by Marc Boutavant, a brilliant French artist, and published by Little, Brown. In the fall, a poetry anthology edited by me and Linda Winston, THE TREE THAT TIME BUILT, will be published by Sourcebooks. This is a collection of poems and comments on science, nature, and imagination, laying particular stress on Charles Darwin and his theory of evolution in this, the bicentennial year of his birth and the 150th anniversary of THE ORIGIN OF SPECIES. I am really excited about both of these books! Mary Ann: Wherever there's sunshine. Mary Ann: You don't really expect me to tell, do you? Mary Ann published her first book, All My Shoes Come in Twos, fifty two years ago. Since then she has authored more than fifty children's poetry books and picture books in verse. One of her books, A House Is a House for Me, won the 1983 National Book Award in the category of children's picture books paperbacks (the last year such an award was given). Her first novel, Strawberry Hill, will be released this July. 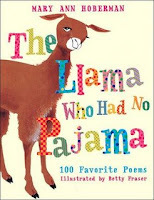 While a number of her older poetry collections are out of print, many of the poems from them were collected in the book The Llama Who Had No Pajama: 100 Favorite Poems. Two of Mary Ann's favorite poems can be found in this book, so I'll share them first! Misbehaves a bit, he said. There are many terrific poems in this collection. Here are two of my favorites. Whenever I read the first poem I utter a silent apology to the long gone family dog. And I am his mother. And off down the block. At the sight of a cat. And do what you do. And know what you know. And you could try me. Two additional poems from this collection can be found at the Poetry Foundation web site--Fish and The Folk Who Live in Backward Town. Mary Ann has written poems that cover every topic imaginable, from all kinds of animals (ants, whales, giraffes, penguins, etc. ) to common childhood experiences (sick days, playing dress up, learning to swim, eating vegetables, ice-skating, birthdays, etc.). In everything she writes the reader finds an open door to childhood in all its wonder. The fact that the poems are rhythmic and bouncy and beg to be read aloud just adds to their enjoyment. Here are two of my favorites from the book Fathers, Mothers, Sisters, Brothers: A Collection of Family Poems. And ginger ale with ice. Except that I am sick! My father doesn't live with us. My father doesn't live with me. He moved away when I was three. 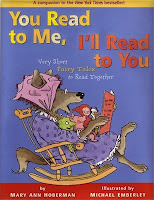 In addition to her poetry collections, I am quite fond of the books in the You Read to Me, I'll Read to You series. Titles include You Read to Me, I'll Read to You: Very Short Stories to Read Together, You Read to Me, I'll Read to You: Very Short Fairy Tales to Read Together, You Read to Me, I'll Read to You: Very Short Mother Goose Tales to Read Together, and You Read to Me, I'll Read to You: Very Short Scary Tales to Read Together. Told in two voices, these rhyming stories are meant to be read loud. Each story appears in three colors--one for the first voice/reader, another for the second voice/reader, and a third for when both voices read in unison. When I wanted to encourage my son to read aloud and wanted to introduce more poetry into his book diet, we started with the Very Short Fairy Tales. Now 8, he still loves reading this together, as well as the more recent Short Scary Tales. Here's an excerpt from Very Short Fairy Tales. There is nothing to fear here, as these fairy tales all have happy endings. I've just scratched the tip of the iceberg here. To learn more about Mary Ann and her work, consider visiting these sites. Many, many thanks to Mary Ann for participating in the Poetry Makers series. All poems ©Mary Ann Hoberman. All rights reserved. I know I've been celebrating poetry all this month, but I couldn't let another day go by without celebrating the beauty that is Brian Floca's new book, Moonshot: The Flight of Apollo 11. If I had to describe this book in one word it would be exquisite. The text is lyrical, immediate, and makes me feel all the anticipation I felt as a child, huddled around our black-and-white television in the living room. I got chills (and a bit teary-eyed) reading this excerpt near the end of the book. It is accompanied by an illustration of a family in a very 60s living room, gathered around a television and cheering. Dad has removed his glasses and is wiping his eyes. calm as a man who just parked a car. "Houston," he says. "Tranquility Base here." The Eagle has landed." On the next page there is a series of illustrations of the Apollo astronauts suiting up. Do you see what I mean about lyrical text? It sits on the fence between prose and poetry, conveying factual information in a remarkably easy manner. Readers follow the astronauts to the launchpad, watch them squeeze into Columbia, follow the GO/NO GO check at mission control, countdown and LIFTOFF! The illustrations are nothing short of amazing. The countdown sequence spread contains a series of panels that moves from the crowds gathered on the beach to watch, to the engines firing, the rocket at the launchpad, the faces in the crowd, one final image of the rocket held in place, and finally a closeup of the astronauts strapped in at the zero count. (You can see a picture of the astronauts on Brian's blog.) The liftoff page (next) shows a closeup of the fiery engines pushing away from the ground as debris falls all around. The detail in the illustrations of Mission Control, the inside of both Columbia and Eagle, and the moon in the sky can be studied at length. There is so much to see! The text ends where the moonshot did, with the splash landing and of the capsule and the return of everyday joys. There is an extensive end note in the back matter that describes the space program, preparations for the moonshot, the actual Apollo 11 flight, and missions that followed. Brian also provides and extensive list of sources used in the creation of the book on the copyright page. The front endpapers include a number of detailed and labeled illustrations of the launch vehicle and command modules, as well as other aspects relating to the launch and flight. Moonshot is a thoughtfully written and beautifully illustrated book. I encourage anyone who believes that nonfiction is boring to pick up this book and see what absorbing, entertaining nonfiction looks like. I'll say it again. This is an EXQUISITE book and a must have for anyone interested in science, US history, or the space program. Heck, it's a must have for everyone. Highly recommended! P.S. - Check out the coloring pages at Brian's web site! Also, SLJ has a wonderful interview with Brian where he talks about his process and shares some of the artwork. The winners of the 2009 Jane Addams Children's Book Award have been announced. The awards are given annually to the "children's books published the preceding year that effectively promote the cause of peace, social justice, world community, and the equality of the sexes and all races as well as meeting conventional standards for excellence." I've been lugging books home every weekend to work on my Poetry Makers posts. This weekend my son went through my bag and found 14 books (14!) by Douglas Florian. As he was flipping through beast feast (the winner of the 1995 Lee Bennett Hopkins Poetry Award) he stopped on the anteater page and said, "Mom, don't you just love this stuff?" I replied, "Oh yes, I love him." OOPS! Secret poet crush revealed to 8-year old! So, while son spent the rest of the afternoon giggling, husband just shook his head and (lovingly) said, "Mom, you're such a dork." Now that I've revealed my super secret poet/artist crush (c'mon, you've all got one, admit it! ), I think we should start with a video of Douglas reading from his latest work. Before we look at Douglas' poetry, let's learn a bit more about him. Douglas: I first started to love poetry in the fifth grade. Actually it was during my summer vacation between 5th and 6th grade when I wandered into the local library in Queens, New York. It wasn't much of a wander, the library being one block away. Anyway, I came across the witty poetry of Ogden Nash. He peeled my mind. He continues to be my favorite humorous poet. Douglas: When I was in high school I wanted to be a cartoonist. One of my favorite New Yorker cartoonists was James Thurber, who wrote hilarious short stories in addition to his hysterical cartoons. My parents owned Thurber's Alarms and Diversions, which I savored many times. So that was my goal: to be a New Yorker cartoonist and short story writer. I never did sell a short story to The New Yorker, but did eventually draw some cartoons for them. That's how I got to meet the late great Charles Addams. My first editor, the illustrious Susan Hirshman at Greenwillow also encouraged me to write. Douglas: A funny thing happened to me. About 30 years ago I was illustrating other people's children's books for Greenwillow and I came across the poetry of Jack Prelutsky. I asked my editor, Libby Shub, if I could illustrate Prelutsky and she said, "Oh, no, there's a whole line of people waiting to do that and James Stevenson already has the job, and he's doing a splendid job." So I decided I would have to write my own poetry to illustrate. Rejection has been very good to me, and now Prelutsky sometimes puts my poems in his books. That summer I wrote about 500 poems, only about 5 of which have ever been published. I intensely studied all the devises, mechanisms, and foibles in all the children's verse I could get may hands or feet on. Douglas: In Queens College here in New York City I majored in art, but I did take a course in poetry, which I hated. The course that is, not poetry. We studied Milton's epic poem Paradise Lost. I got a D in poetry. Douglas: I do an enormous amount of research on my subject. For DINOTHESAURUS this meant going to the American Museum of Natural History several times and reading a great deal of books by paleontologists. The poems emerged from the research, much like a rash or hives. Some poems go through many drafts and revisions. I drove my editor (Andrea Welch) and designers (Ann Bobco and Michael McCartney) crazy with last minute changes. They were very important to the creation of this book. Douglas: The most enjoyable aspect is hearing children laughing at my poems or noticing things in my art. I also enjoy the letters I get from kids telling me how much they love poetry and painting. 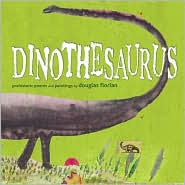 Douglas: Actually DINOTHESAURUS is my favorite, and it's my editor Andrea's as well, "hand's down." A recent starred review in Publishers Weekly echoed the idea. Douglas: I'm doing the art now for a book of poetry about trees. It's growing very well, thank you. There's a few surprises in it, but you'll have to wait until next Spring to see how I'm branching out. Douglas: Ogden Nash for humorous poems. Allen Ginsberg for tragic ones. And Shakespeare for LOVE Sonnets. Douglas: My favorite place is anywhere. Is anywhere good for you too? All I need is a scrap of paper, a pen, and an idea, and ideas have a way of popping up anywhere they want, uninvited. Douglas: Lee Bennett Hopkins, of course. My affinity for Douglas' work should come as no surprise to readers of this blog who know of my love for the connection between science and poetry. Douglas has written about seasons, space, animals (hundreds of them! ), and dinosaurs in a way that marries a love for language, wordplay, art and content. Don't believe me? Here are just a few examples. Once wiggling wild beside a log. Schemes of racing red-backed vole. She dreams without a single sound. And dreams of snowmen, sleigh, and sled. It's merely somewhat dark to view. Gladly back after a while. At sunset look due south to sight. Night by night, then start again. What's the first rule of writing poetry? There are no rules. Poetry rules! In other words, you can spell words wrong, use bad grammar, write words upside-down, or even invent new words. In fact you can do anything you want as long as it makes your poem better. That's called poetic license. Your poetic license lets you drive your poem anywhere you want. For example, in my book, Laugh-eteria, there's a poem called "Dracula" where I rhyme Dracula with blackula, snackula, and Cadillacula (as a matter of factula). Now, you won't find those words in any dictionary. I made them up! You can invent new words too. What do you call a hippo with the hiccups? A hiccupotamus. What is an octopus with socks on? A socktopus. And why does an elephant need a big nose? To smellephant. Here are a few poems containing Douglas' "invented" words. In many cases, these are very playful spellings! A poem on an ANT. It's just an ostrich rhearranged. Flew ptours the ptime of dinosaurs. The pterrorized the pteeming air. This last poem is from Douglas' latest book, Dinothesaurus. Leading up to its publication, Douglas shared quite a bit of the artwork and some of the poems on his blog. I could go on, breaking all kinds of copyright law and expounding on what I love about Douglas' work, but I'll summarize by saying that I'm always entertained and often surprised by what I read. In some cases I feel like he's hit upon a truth that is just so obvious, I'm not sure why I didn't think of it myself. Since the semester is coming to a close here and we're rushing headlong into summer, I'll share one final poem on what lies ahead. I hate that summer goes so quick. To learn more about Douglas and his work, consider visiting these sites. Hats off to Douglas for participating in the Poetry Makers series. All poems ©Douglas Florian. All rights reserved. I can hardly believe it, but April is nearly over. I honestly didn't think I'd make it. It has been a lot of work, but I have had SO MUCH FUN and learned a great deal. There are three days left and three Poetry Makers still to come--Douglas Florian, Mary Ann Hoberman, and Pat Mora. On the 30th we'll be celebrating Día (El día de los niños/El día de los libros (Children's Day/Book Day). We'll also be celebrating the second national Poem in Your Pocket day. What will you be carrying in your pocket? After long deliberation I've decided to carry W.S. Merwin's poem "Just Now." 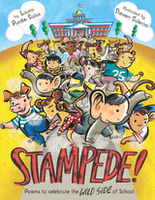 Stampede! goes to . 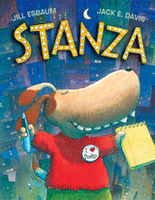 . .
Stanza goes to . . . Yesterday I went to Barnes and Noble with William and a good friend. (Our favorite children's bookstore was closed! What's a reader to do?!) I left with many books. Too many! My friend just shook her head and told me I have a sickness. I did try to rationalize the purchases (you're surprised?) saying that most came from the bargain shelf or the 50% off table. I am drawn to the sale table largely because I find something very sad about remaindered books. I wonder if authors feel this way when they see the pieces they've worked so hard to bring to market moved into this arena. When I find great books in such places, I rescue them and save them for workshops, school visits, or gifts for teacher friends. Today I'm giving them away to celebrate National Poetry Month! I rescued TWO copies of the fabulous book Stella, Unleashed: Notes From the Doghouse, written by Linda Ashman and illustrated by Paul Meisel. I want to pass them on to homes or classrooms where they'll receive lots of attention and become dog-eared because they've been loved so much. Leave me a note about what you love most about DOGS (sorry all you cat lovers) and I'll enter you in the drawing to win. You have until midnight on Wednesday (April 29) to enter. I recently wrote my first sestina. It wasn't horrible, but it wasn't very good either. I wish I had known about the tritina when I began grappling with the sestina from. It might have made it a bit easier to handle/understand. In writing about Helen Frost, today's Poetry Maker, I found a number of worksheets on poetic form on her web site. She suggests starting with the tritina since the sestina is a more difficult form. What a great idea! Here are the nuts and bolts of the form. So, your challenge for the week is to write a tritina. Leave me a note about your poem and I'll post the results here later this week. Have fun! When Diamond Willow won the Lee Bennett Hopkins Poetry Award this year, I thought Helen Frost's name sounded vaguely familiar. Much to my dismay, I learned that this wasn't because I knew Helen's poetry (oh, how much I was missing! ), but rather because of a number of books on my SON'S bookshelf—Alosaurio/Allosaurus, Estegosaurio/Stegosaurus, Mamut lanudo/Woolly Mammoth, Tigre dientes de sable/Sabertooth Cat, Tiranosaurio rex/Tyrannosaurus Rex, and Triceratops/Triceratops. Helen has written 130 titles, the majority of them nonfiction titles for Capstone Press. If you do not know her poetry, you're missing something really special. After picking up Diamond Willow this winter, I sought out and read all ALL of Helen's poetry books to date. I was not disappointed. Before we look at Helen's poetry, let's learn a bit more about her. Helen: I like William Stafford’s answer to that: What made everyone else stop? Helen: A big pile of shiny paper on the top shelf of a closet and a pen I could scribble with. Someone gave us the paper because there were ten kids in our family and they figured we could use it, which was true. I don’t think we ever used it all—of course we must have, but it felt like an infinite supply. Scribbles evolved into words, words into poems. I still love that feeling of pen in hand moving on paper, creating word-music and images. Helen: Yes. Philip Booth, W.D. Snodgrass, and William Stafford were among my early teachers. I took as many poetry classes in college as we were allowed to take, and attended all the poetry readings. As an adult I went to poetry conferences, took part in workshops and writing groups, read lots of poetry and books about poetry, took part in poetry listservs, subscribed to poetry journals. Although I’m now more often a teacher, I continue to learn in all these ways. And I want to add that, for the past ten years, my editor, Frances Foster, and others at FSG, have been an important part of my writing process. Sometimes years (even decades) after I have shared poetry with a young person, I will hear how poetry was a lifeline at a time it was most needed. Helen: Not really, but I can mention one I love: the poem on page 107 in Diamond Willow where the mouse says “squeak squeak” and Roxy goes “Arf, arf” and Willow is almost in on the secret between them, but not quite as much as the reader is. The first time I was in a classroom where the students, 5th graders, had read Diamond Willow, a mouse got in the classroom the day of my visit, and all the kids thought it came in because that poem invited it to do so. I’m pretty sure they were right. Helen: Crossing Stones is coming out next fall, so that’s finished. I’m now working hard on The Watching Rock, about two contemporary teenage characters who are descended from Jeannie and Sarah, in The Braid. These three novels-in-poems, and also Diamond Willow, are all related, and work together to portray the ways in which we are all connected. It’s been a five or six year project for me. When I finish The Watching Rock, I’ll probably be ready to work on something completely different. Helen: I’ll name a few I love: Elizabeth Bishop, A.A. Milne, Denise Levertov, Randall Jarrell, Muriel Rukeyser, William Stafford, George Herbert, Gwendolyn Brooks, William Blake, Gerard Manley Hopkins, Emily Dickinson, Langston Hughes, Philip Booth—I have to think hard about who is considered not to be alive right now. And since I work in the "inter-tidal zone" between poetry and fiction, I want to include Virginia Hamilton, whose novels, especially Sweet Whispers, Brother Rush, feel so much like poetry to me. Helen: A clean quiet room. Helen: I’m glad this isn’t my decision. I can think of at least eight poets I think would be wonderful in that role. And really, I love the way we’re all working together, doing the Laureate work with or without the laurels. Diamond Willow is a verse novel told in a series of diamond-shaped poems. Within each poem there are a few bold words that, when read from top to bottom, form a poem-within-a-poem. This mini-poem hits right at the heart of larger poem it is contained within. The story follows Diamond Willow, a young girl living in the Alaska wilderness who convinces her parents to let her take the sled dogs to her grandparents' house. Along the way tragedy strikes and Willow must do whatever she can to help her dog Roxy survive. Willow's narrative is told entirely in her diamond-shaped thoughts, but as the story progresses, these are broken up by the voices of animals, animals that bear the names of her ancestors. Here is a poem from the beginning of the book. It's where we learn how Willow feels about dogs. they slobber on you sometimes. Here is one of my favorite poems from the book. An animal . . .
moving beside us and keeping up. I followed my reading this amazing book with Keesha's House, a 2004 Printz honor book. Keesha lives in a home where troubled teens can feel accepted. She takes on the responsibility of caring for others who find their way to this haven. The poems in the book, written in the form of sestinas and sonnets, tell the story of the residents. Here is one of the sonnets. students in my sophomore honors class. her grades have fallen, first to C's, now D's. she has to be at work by three o'clock. She didn't turn her paper in today. her extra time. She doesn't want to talk. This is a tough book to read, but with the turn of a page it moves from gritty to heartfelt and back again. It is a roller coaster ride of emotion. Helen clearly has her finger on the pulse of adolescents in this book, writing about the hardships they face, the harsh realities of life, the ways in which they deal with whatever is thrown at them, and the immense wells of strength and courage they draw upon. Other poetry books of Helen's include Spinning Through the Universe and The Braid. Spinning Through the Universe is a verse novel that introduces readers to a fifth grade teacher and her students as they talk about their lives at home and at school. This book uses an amazing 22 poetic forms to tell the stories! The Braid is the story of two sisters, separated by an ocean during the 1850s. The stories of Sarah and Jeannie are told in alternating narrative poems, which are braided at the edges. Between the narratives are praise poems. In the “Notes On Form” Helen writes, “I invented a formal structure for this book, derived in part from my admiration of Celtic knots”. Invented indeed. This is precisely what I have fallen in love with in Helen's work. She has pushed the edges of creativity and imagination and given us much that is truly new. If you aren't familiar with Helen's poetry, or haven't taken the time to read it, I hope you will. I feel as though I've discovered a hidden gem in finding my way to her work. I know you will feel the same. To learn more about Helen and her work, you can visit these sites. Many thanks to Helen for participating in the Poetry Makers series. All poems ©Helen Frost. All rights reserved. Winston Breen's Puzzle Party - Coming Soon!